Many business owners know that they should be blogging on their websites. However, they don’t really understand why, so it makes it hard for them to write the types of posts that their audience needs. The team here at WPamplify uses blogging to help their clients. The more content on your website, the more organic traffic you will receive. Every day, users type in unique searches that have never been searched before. The more content you have on your website, the more likely you are to pick up some of those unknown searches. When you write content that is rich in keywords, highly valuable, and consistent, you show Google that you are a source to be trusted. Also, when you increase the number of pages on your site, your rankings go up. It’s estimated that websites with 51-100 pages get 48% more traffic than those with less than 51 pages. After you write a blog post, you can share it on your social media pages. If your followers find your article of value, they might share it on their own pages. When this happens, your business is exposed to even more people. To get the most out of your blog, you should make it a habit to share old posts on your social media. You can even track the success of old posts to see how popular they were and share them more often. Don’t be afraid to repost your best blogs, because many people may not have ever seen it. If you write content that is full of great information, you have a better chance of being backlinked to. Brian Dean just released a content study that showed blogs that are 3,000 words or more are more likely to get linked to than to those that are shorter. Backlinking established domain authority with Google. Basically, this means that if other websites are linking to your site, it tells Google you are legit. They’ll be more likely to send people to your site than those with less domain authority. Anytime you write a blog post for your business, you should share it with your newsletter list. Do a short intro to your article and then link to it. Make sure you write an eye-catching email title to entice your list to open. This is also a good way to segment your email newsletter list. You can always send information to people that clicked on specific types of content in your newsletter. Build specific campaigns to people that clicked over to your site through the blogs in your newsletter. 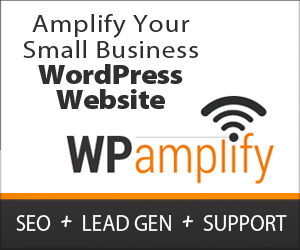 If you are ready to start blogging for your business, get in touch with our team here at WPamplify. We write content that is unique to you and shares your brand message with your audience. Our content team works hard to come up with titles and incorporate keywords that will bring your target audience to your site. Get in touch with us now so we can get started on your SEO. We look forward to hearing from you.